Whenever I’m in Sao Paulo, I have lunch at an all-you-can-eat veggie buffet close to our hotel. The buffet always varies a little. 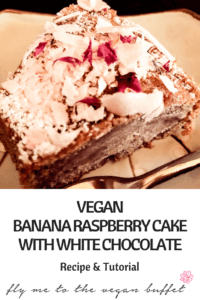 Once they had a banana cake that was just the perfect dessert and at home I found that it might be even more fun with raspberries and white chocolate. It turned out delicious. 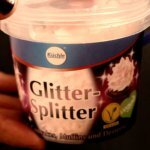 I decided for a girly variation with glittery wafers and edible dried flowers*. Preheat oven to 350°F. (175 °C) Whisk bananas, agave syrup, canola oil and plant milk, flour, baking soda, baking powder, salt, and vanilla together. Just until combined, do not overstir, that could make the cake too chewy. 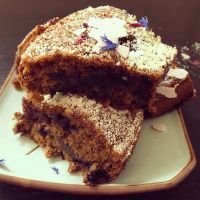 My cake always turned out great throwing everything in one bowl, and just mixing it as short as possible, but to avoid overstirring, you can mix the bananas with the wet ingredients first and then combine the mixture with the dry ingredients. 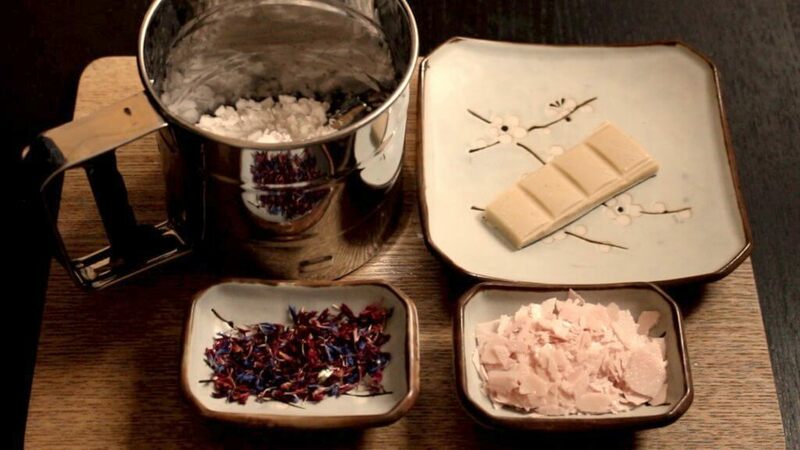 Then grate white chocolate and mix with raspberries and agave syrup. 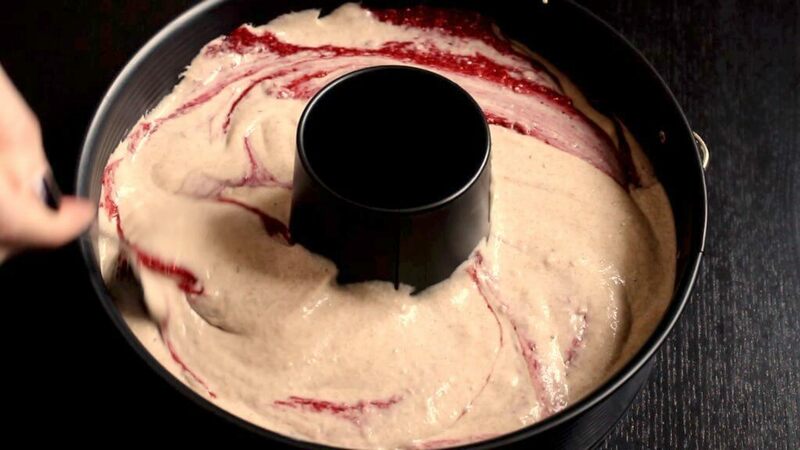 Pour half of the cake dough into a lightly greased form (I used a 24 cm/ 9 1/2 inch bundt cake form*), then add the raspberry mixture, then the other half of the cake dough. 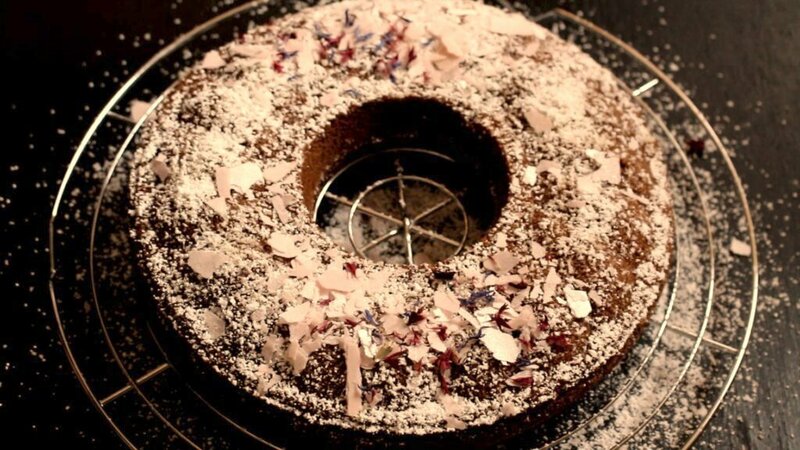 Gently draw a fork through the batter, marble cake style and bake for about 45 minutes. After the cake cooled off a little, grate remaining white chocolate over the cake, then a little powdered sugar, and decorate. 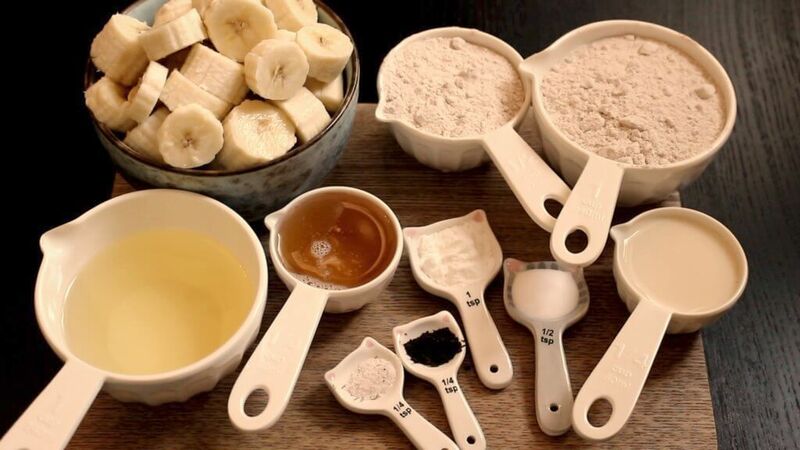 Whisk bananas, flour, baking soda, baking powder, agave syrup, canola oil, plant milk, salt, and vanilla together until just combined, don't overstir. 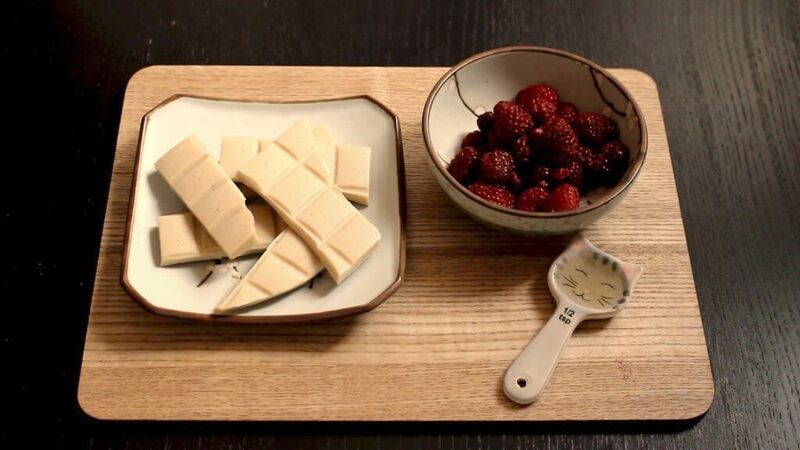 Grate white chocolate and mix with raspberries and agave syrup. Pour half of the cake dough into a lightly greased form (I used a 24 cm/ 9 1/2 inch bundt cake form), then add the raspberry mixture, then the other half of the cake dough. 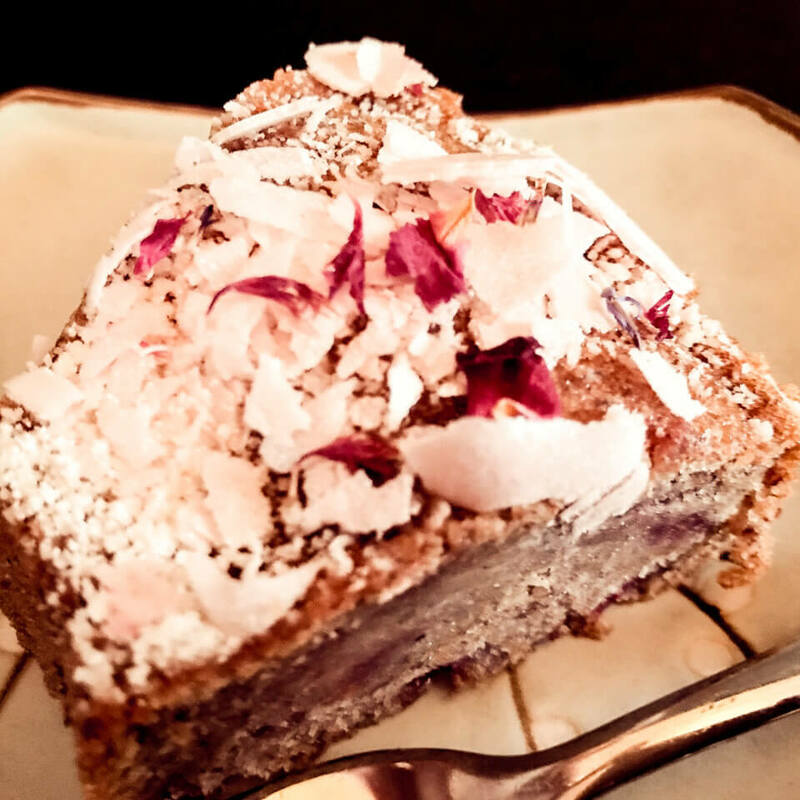 Gently twist a fork through the batter, marble cake style and bake for about 40-45 minutes. The cake should cool off for about 20 minutes before decorating.